Kornati Islands General information KORNATSKI OTOCI (Kornati Islands), the largest and densest archipelago in the Adriatic Sea; consists of 147 islands, islets and reefs comprising an area of 69 sq km, scattered at an area of 234 sq km. They stretch in the length of about 35 km and the width of 13 km, between the island of Dugi Otok in the north-west and the island of Zirje in the south-east, as well as between the islands of Pasman, Vrgada and Murter in the north and the north-east. They were named after Kornat, the biggest island (32.62 sq km). Pliny called them Cratea . On the south-western side, toward the open sea, the coasts are extremely steep (cliffs or crowns); the highest cliffs are those on Klobucar (80 m), Mana (65 m), Rasip Veli (64 m) and elsewhere. Due to limestone formation there are no sources or water streams on the Kornati Islands. In some karst depressions, whose bottoms are covered by red soils, water retains almost throughout the year. Brackish water may be found in karst cavities at some 40 locations. Rainwater is collected in cisterns. Winters are mild; an average air temperature in January is 7.3 °C and in July 23.9 °C. Maximum air temperatures do not exceed 33 °C and minimum air temperature does not fall below -7 °C. There are 106 clear days, 134 moderate cloudy and 125 cloudy days in a year. Air humidity reaches 65 %. There are also 115 rainy days in a year. Snow occurs very rarely. Due to the unfavourable dynamics of rainfall and air temperatures during the vegetation period, and because of limestone formation, the vegetation on the islands is very sparse. The predominant type is rocky ground with sparse pastures. Only on the north-eastern side of the Kornat Island, near the Stativala Cove, there are some areas under holm oaks. Red soil fields, mild slopes and coves provide good opportunities for the cultivation of olives, figs, vines and citrus fruit. 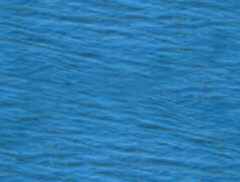 The Kornati area is one of the richest fishing grounds in the Adriatic, especially rich in benthos species. 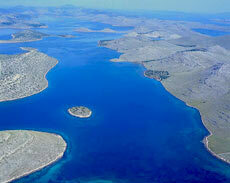 In 1980 the islands were set aside as a national park; the present area of Kornati National Park is 234 sq km. The Park is managed by a special management body with the seat in Murter. From the 14th century the island of Kornat had several names: Insula Sancte Marie , Stomorin Otok, Tarac, Toreta (Tureta). In the 17th century the archipelago got the name Coronati . The Kornati Islands were populated as early as the Neolithic. In recent times there are no permanent habitations; the last of them was mentioned in the 18th century under the name Toreta. The Kornati Islands had long been owned by Zadar. In the 16th century they were -under the Venetians, who subleased them to the families from Zadar. - The oldest archaeological finds on the island of Kornat are the remains of Illyrian settlements (Strazisce, Toreta) and stone grave-mounds. The remains from Roman times have been found on the hill Toreta; at the foot of the hill, on the southern side are the remains of an early Christian church with a semicircular apse. A smaller church, preserved until the present, was later constructed in it; the lower threshold of the church is a Roman votive inscription. On the very hill is a large quadrangular tower, built at the beginning of the Middle Ages. The remains of a mediaeval tower may also be seen on the islet of Panitula, and on the island of Jadra there is a church from the 16th century. "On the last day of the Creation God desired to crown his work, and thus created the Kornati Islands out of tears, stars and breath" - wrote George Bernard Shaw. Beautiful nature, a network of countless islands and islets (a folk saying goes: "one island or islet for each day of the year"), the magnificent sea - all this makes the Kornati Islands an attractive destination of numerous excursionists and boaters. The Kornati are a true promised land for boaters and yachting enthusiasts. Numerous coves provide safe shelter to boaters and fishermen. However, the submarine zone is also protected in the National Park and visitors are advised to ask what, how much and in what way may be caught. The islands abound with karst phenomena, cavities, caves, gullies, crevices, and represent the natural habitat of a number of bird species. The islands are a unique pleasure and experience to all those who are keen on bathing in the crystal-clear sea, who appreciate peace and quietness but also feel enthusiastic about eco-tourism without any modern facilities. Boaters spend the nights on their own or rented boats, the other may rent a modest house or just a stone cottage. Those visitors who are not familiar with yachting may learn this at the right place, on the Kornati Islands, in one of the yachting schools that take place in this attractive environment. The Kornati Islands have a number of small coves, "wild" harbours, where boaters may take shelter and dock. However, there is also a modern, well equipped marina - Piskera ACI Marina, located on the island of the same name (see Piskera ), with 120 berths. On the island of Zut, outside the boundaries of Kornati National Park, is Zut ACI Marina, also with 120 berths.